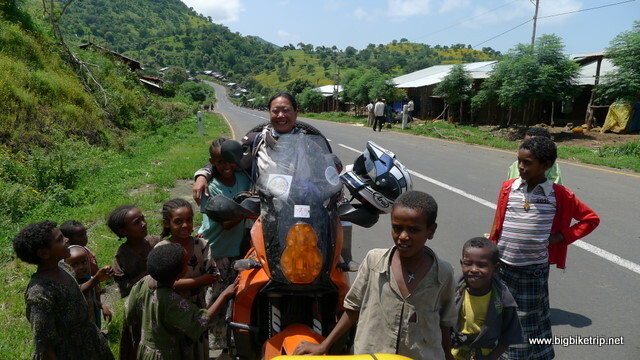 The best and worst awards for our motorcycle expedition across Africa, Europe and Asia. Whilst the two of us are in agreement, we realize that many may disagree and so we welcome any comments. 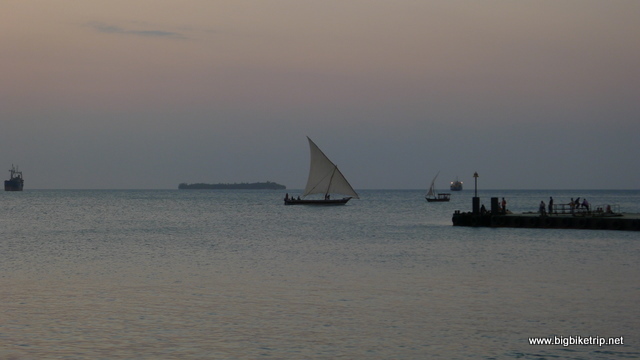 Tanzania just eclipses Kenya, Namibia and South Africa as our favourite country in Africa. Good infrastructure, decent roads, amazing scenery, friendly people, and abundant wildlife. and our all time favourite camping spot on our whole trip, Lake Charla. Many people are already aware of the amazing places to see in Turkey, Austria, Italy, Spain, France, Greece etc…and we were privileged to do the European grand tour and take in many of the sights. Italy was absolutely fascinating, superb architecture, rich history, good food and wine, but not the easiest place to motorcycle in due to local driving conditions. . Good, but not great. France was our biggest surprise. It is Britain’s next door neighbour and often maligned by Americans for being, well French, and by the English for old rivalries and wars over the centuries. 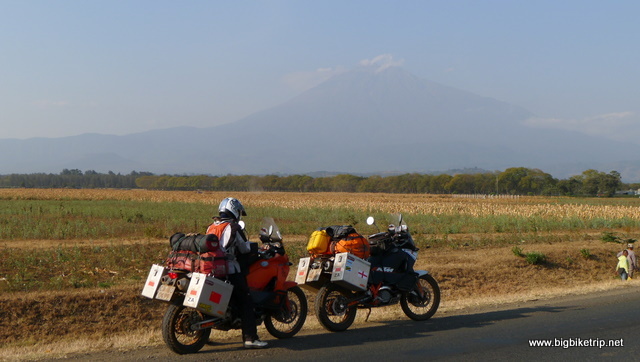 However, we found it to be a stunning country and a motorcycling heaven. The Alps, Provence, the Southern coast, Loire valley, the wine-lands of Burgundy, pretty Brittany, the battle fields of Normandy and the many charming villages and towns we rode through. So much to see and we were treated very well by everyone we met… even by the Gendarmes. However, taking the best motorcycling country in Europe award is Scotland…. especially western Scotland (see UK revisited chapter). Due to the Gulf Stream that course up the west of the British Isles some parts of northern Scotland that are not far from the Arctic Circle are quite mild. It is, however, safe to say that the weather isn’t always as glorious and when I was there and can be decidedly wet and blowy. Its gets even more like Tibet … mountains and big hairy things in the road. There were no countries we did not enjoy to one degree or another. Ethiopia, undoubtedly rich in history and resplendent in natural beauty is a bit of a tragedy on the human side. The country, especially the cities seems to have been left to rot and stagnate. Ethiopians, a handsome lot as people go, appeared to be incredibly needy and nearly always had their hand out stretched begging for money. They often leaped out at us or grabbed our arms whilst shouting… ‘You, You, You…Money, Money, Money’. It was tiresome, annoying and ever so slightly sad. CHINA is a country on a continental scale and by far the most varied and diverse country we went to. There were impressive and well planned super cities like Chengdu, Nanchang, Beijing and Shanghai, and prettier tourist towns like Lijiang, Yangshuo and Dali. We also rode through some of the most charming and idyllic countryside I have ever seen. Some rural areas have remained as they have been for centuries, despite the rapid pace of development going on around them. But in China there are also some of the worst and most polluted places I have ever seen. Environmental plunder, architectural vandalism, motoring misery and pitiful squalour on an unprecedented scale. Quite a shock. Some of the second and third tier Chinese cities were absolute shockers. Polluted and crowded beyond belief, bad roads and atrocious traffic jams, ridiculously bad urban planning and blighted by hideous buildings as far as the eye could see. Hong Kong and China seem to have a fatal attraction with adorning the outsides of their ugly concrete boxes with cheap toilet tiles. Whether fascinating or depressing; ugly or stunningly beautiful; our experience riding over 13,000 kilometers through China was hugely rewarding and something we will never forget. BIGGEST SURPRISE AWARD – SUDAN. Sudan was our biggest surprise and we thoroughly recommend visiting. It was a complete re-write of everything I had previously thought about its people and their culture. The kindness, politeness and gentleness of many of the people we met was incredible and we are very grateful to the hospitality extended to Fanny and I by many of the people we encountered. That said, a cold beer in the scorching heat would be nice, as would a bacon sarnie with HP sauce, but I guess you can’t have everything. Treat it as a liver detox! 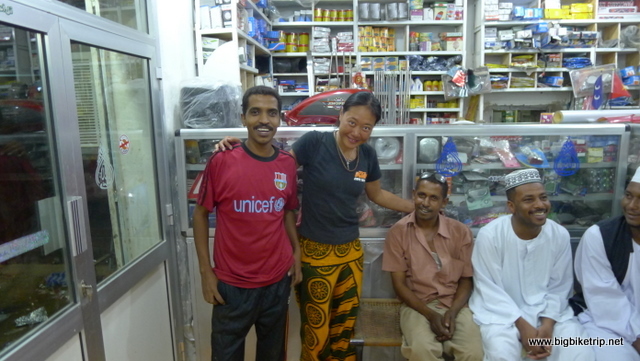 Kindness and hospitality given to Fanny and I in the middle of the Nubian desert in Sudan. Its strange that those with so little always offered us so much … and the converse! 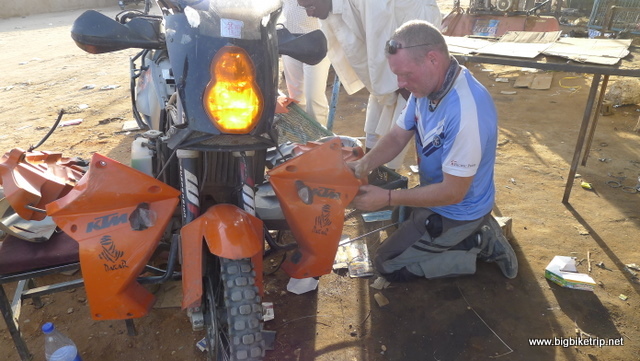 Replacing the starter relay in the middle of the Nubian desert in 50+ degrees heat. We never really had any very bad experiences. We managed to cross Africa without being eaten by wild animals, without having to pay a bribe, without being infected by deadly diseases, nor kidnapped by pirates or Jihadi nutters. Our KTM 990 Adventure motorcycles have been superb, a joy to ride and very reliable. 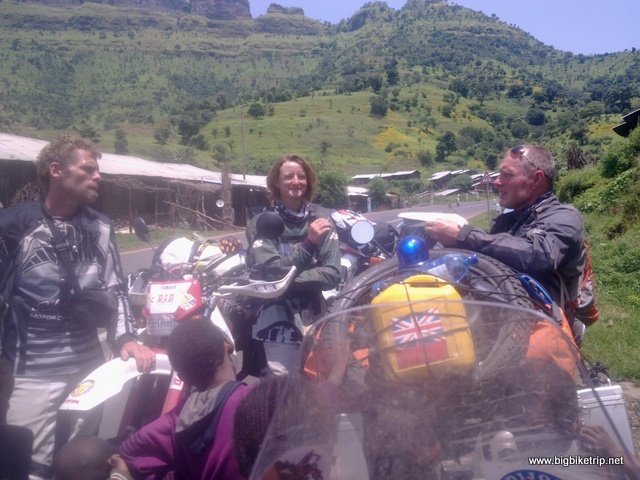 The vast majority of people we encountered on the expedition have been wonderful and treated us very well… the only exception being a few excitable types in Ethiopia who threw stones at us or lashed out as we were riding by with whips and sticks. Most of the border crossings and tourist locations attracted annoying touts, “shiftas” and fraudsters who were keen to relieve us of the few possessions we had. They were all unsuccessful. 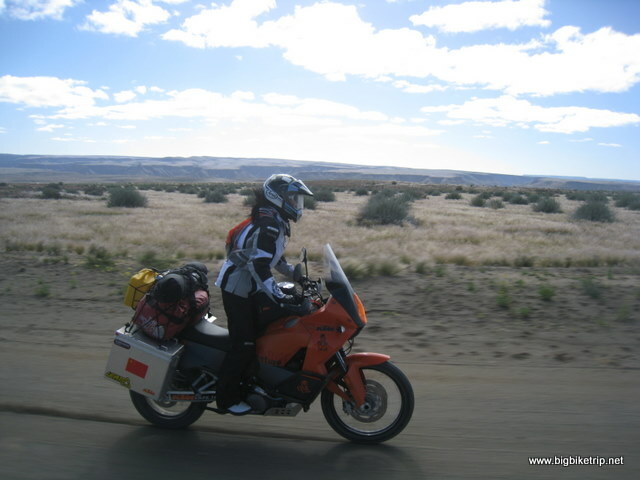 A particular low was early on in the expedition when Fanny lost control of her motorcycle in the Namib Desert and came off at speed. 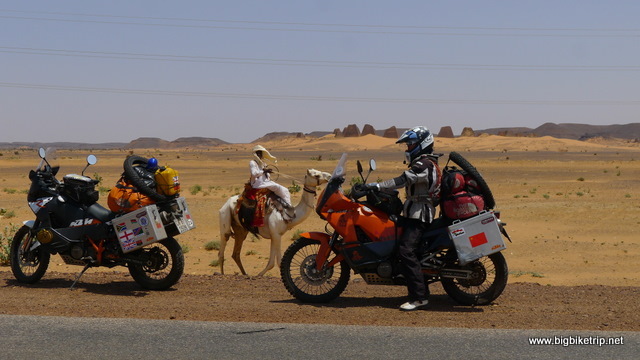 Fortunately, Fanny and her KTM motorcycle are a tough team and in no time were back together charging through the desert, albeit with a few scrapes and bruises. In Europe our experience in Switzerland was not great, Fanny got arrested for involvement in an accident that wasn’t her fault, everything always seemed to be closed, everything was expensive, and we could hardly describe the Swiss as the friendliest people we met on our 53,800 kilometer ride around the world. That said Switzerland is a very pretty country and we enjoyed riding through the Alps and up and down the many meandering passes. In China/Asia I think the worst experience was just outside Chongqing City when a traffic official threw a traffic cone at Fanny while she was riding on the highway and knocked her off her bike. Anywhere else in the world this would be considered a serious criminal offence and front page news, but in China abuse of power by the authorities is common place and the “people” can’t do much about it. Fanny was injured slightly and very upset by the incident, but she managed to get back on her motorcycle and carry on. Not being allowed to ride in certain Chinese cities and on most of the Chinese highway network is also pretty annoying and downright unnecessary in modern China on a modern motorcycle. Apart from these incidents, and of course me getting stopped by the police at every single road block in Tibet, we had a really great adventure in China and had the chance to see places that very few people even know about, let alone visit. USA? Its a continent sized and a very well developed country that most non-Americans will know well enough through the ubiquitous TV shows and movies. Big, amazing wilderness, beautiful scenery, wealthy, but with a dark and sinister underbelly, especially in the inner cities. To to be honest we still have a lot of riding to be done and places to see in the USA. So far we have explored Washington, Oregon, Montana, California, New Mexico, Arizona, Utah, Wyoming, and Colorado in the west, and New York, Pennsylvania, Michigan, Massachusetts, Connecticut and Ohio in the east. The south and the center remains to be explored. From what I’ve seen of the rest of world, America sits in the middle ground. Its easy to get around, everything is super convenient, there is not a great deal of culture or history, the roads are far too straight and dull, and its not as “great” as Americans think it is. Nothing really interesting, and nothing really bad, except the food which is on the whole….a mixture of sugar and lard with a sprig of rocket. I am afraid to so that Fanny doesn’t like America, but then she is a pinko commie! South America? That remains an adventure for the future. A fuzzy unfocused picture of one of the officials who threw a traffic cone at Fanny and knocked her off her motorcycle. My hands were shaking with rage but I resisted the urge to administer some summary justice and so we got back on our motorcycles and carried on. These police in Hubei were very friendly and kind… in fact with a couple of exceptions that we write about in the diary, the authorities in China treated us well. 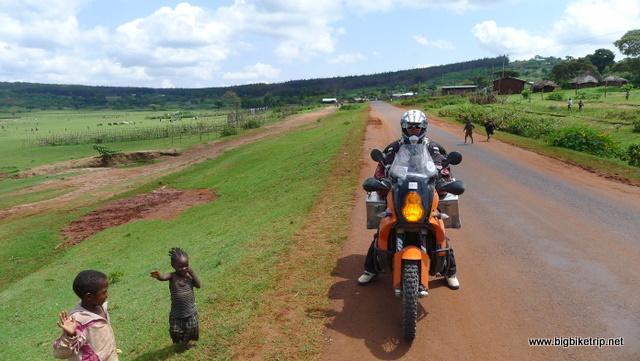 When riding a motorcycle through Africa the last places you really want to see are the cities. The joy of riding through Africa is the beautiful countryside, meeting its people, and enjoying the amazing African flora and fauna. 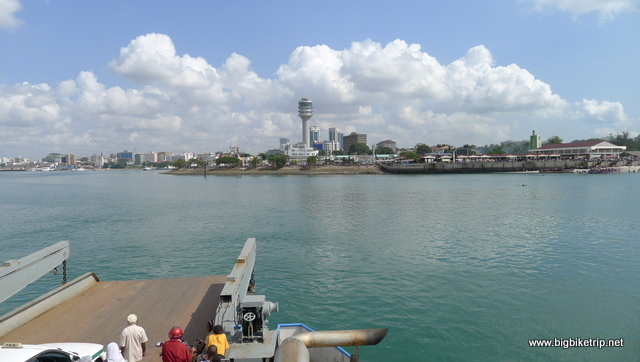 However, if pressed to pick an African city I would say Dar Es Salaam because it is a very interesting and lively city, friendly people, good food, and one of the few cities in Africa I could live in outside South Africa. Traffic is quite bad though, but nothing two bikers from Shanghai can’t handle. It is a difficult call to decide on the best city award for Europe. We enjoyed many. Lucca, Rome, Florence and Pompei in Italy; Saint Lo in France; St. Sebastian in the Basque Country; Barcelona in Spain; Saltzburg and Vienna in Austria; and Old Town Rhodes in Greece. We thoroughly enjoyed them all. However, if we are pushed to choose one then Istanbul takes the award. Its got it all… great food, wonderful art, kind friendly people, fascinating history, amazing architecture, the east meets west straits between Black Sea and Marmara Sea, and yet its very much a first world city, things work and it feels very welcoming and exciting to be there. Fanny wandering along the streets of Taksin in Istanbul… a super city. I am not even going to consult Fanny because she will say Shanghai. It’s like asking a panda what its favourite food is. I thought our ride through China was absolutely fascinating. There are hundreds of cities in China with populations over a million people… many are over 20 million and therefore bigger than many countries in the world. Each city is diverse with the richest and poorest, ugliest and prettiest and tastiest and revolting all in one place. Cities to mention are Beijing where I went to university and have a special fondness for, colourful and spicy Chengdu in Sichuan (and prettiest women! ), exotic Dali in Yunnan, the amazing “Red City” of Nanchang in Jiangxi, so called because its the home of the “red” revolution. However, our ride through Tibet is probably one of the highlights and so therefore Lhasa, its provincial capital stands out as the best city to see in respect to scenery, architecture, history and “never seen before” general interest. Fanny and I high up on the Tibet/Qinghai Plateau… the world’s highest. We were looking forward to Addis Ababa, a name that conjured up exotic images formed from school days for me. However, when we got there we found it to be a complete karsi. 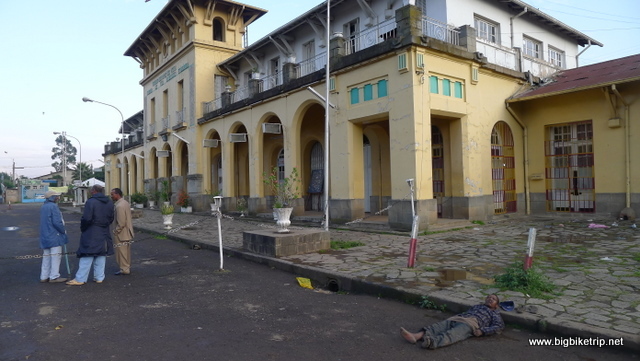 The decrepit and forlorn looking train station from a bygone era pretty much sums up Addis Ababa ‘s decline into squalour and poverty. Again corruption and inability to use a condom are to blame. Aggressive touts, annoying kids, unfriendly and hostile looking soldiers and policeman, and crumbling and decaying infrastructure. Its a big disappointment. Fortunately we found refuge in a little oasis in the middle of this complete dog nest called “Wim’s Holland House”. 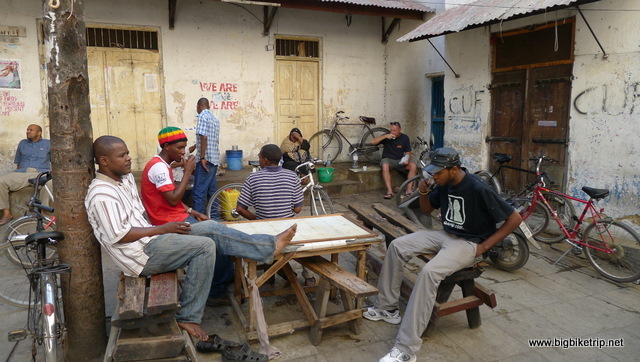 Not the greatest backpackers in Africa, but the Dutch owner, Wim runs a decent hostel that serves more than the Ethiopian staple dish of Tibis and sour pancakes and has a well stocked English pub-like bar that serves draft St.George’s beer. China is basically a large continent and currently going through the biggest phase of development any country has been through…ever, and so some of its second and third tier cities (or lower) can easily qualify for worst, ugliest, most polluted, most corrupt, most congested, unhealthiest city anywhere on the planet. Many people in China and Taiwan throw rubbish and pollutants into the rivers, streams, or just outside their homes ….anywhere except a rubbish bin. Its extremely depressing and disturbing. Hidden industrial pollution is off the scale. A lot of China looks like this… a dusty, muddy, grey construction site on the cheap. EUROPE – LUTON … Picking a worst city in Europe is a difficult one. Athens promised so much and delivered so little. We did wander around to see the sights of Ancient Greece, but the modern day city was depressing and the economic gloom palpable. The city of my birth, London, is a mixed bag. A disappointment on many levels, can no longer be considered “English”, but still an iconic and interesting city if you focus on the positives such as history, art and culture. However, if I have to pick a candidate for worst city in Europe then I am going to say Luton or Slough in the United Kingdom. Sorry Luton and Slough…… someone has to come last …..and you made no effort not to. The mangey cats and dogs throughout Ethiopia are covered in them, as are most of the carpets, furniture and bedding. The lush grassland, especially after the rainy season is also home to ticks. As we were camping we had to remove quite a few of these little blood suckers that somehow found their way into various nooks and “fannys”. China … umm? Let’s say Hong Kong … the standard is so incredibly poor. The World …. everywhere in China, followed very closely by Egypt and Bangkok in Thailand which is dangerous on a bike. Sri Lanka … driving standard is also pretty ropey … but at least its slow. Tanzanian bus and truck drivers could take some kind of bad driving award judging by how many we saw overtaking dangerously or wrecked by the side of the road, but Egypt takes the “worst driving” award in Africa by a mile. They are absolute shockers. Maybe its because everyone is too busy shouting into their mobile phones all the time, or perhaps because everyone employs millimetre collision avoidance techniques, sometimes with success and sometimes without. I saw a taxi mount a curb as the driver attempted to tackle a roundabout with one arm twisted around the wheel and the other holding a phone to his ear. Rather than put his mobile phone down and use both arms to turn the wheel he preferred to carry on talking, veer off the road and mow down some pedestrians. Tahrir Square, in cairo with the government building we had to go to in order to extend our visas at the top left hand side. 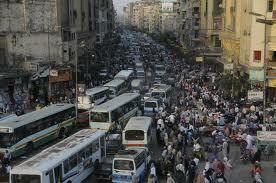 The Spring revolution was in full swing when we arrived in Cairo and so it was an interesting time. We have a difference of opinion due to our different levels of riding experience. 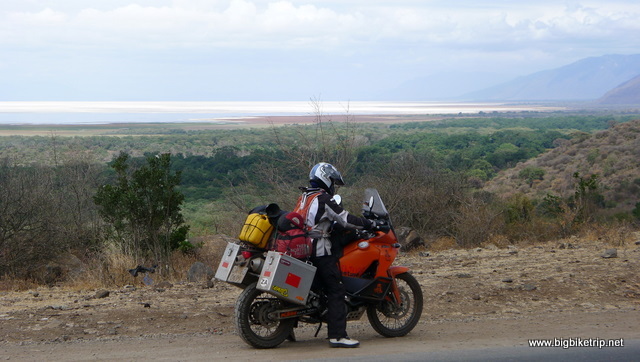 Fanny goes for Tanzania for the same reasons (above) as for best country and I go for Namibia, to my mind the most awesome motorcycling country… anywhere. Challenging, technical in parts, mind blowing scenery and importantly very few people and other vehicles. 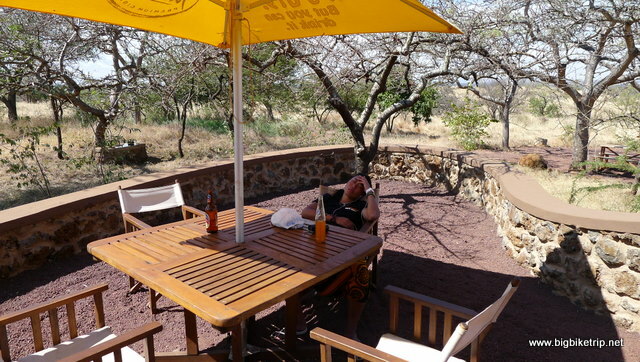 Its got sand, gravel, rocks, hills, deserts, salt pans, seascape, bush, wild animals, birds and fresh air…. AND no road blocks, no speed bumps, no police and no speed cameras. I also really liked the Nubian deserts of Sudan. Clean, beautiful and spectacular. Left or right? Freedom to do whatever. Scotland was a big surprise. In Jubilee year, 2012 when Fanny and I arrived in the UK we planned to ride to Scotland, but the weather was absolutely atrocious. A year later during what everyone was calling “The Summer of 2013” the weather was absolutely glorious and western Scotland gave me some of the best riding I have ever experienced. Not to take anything away from Scotland, my KTM 990 Supermoto T I was riding was one of best motorcycles I have ever ridden. I have to say it was an awesome ride and Great Britain was truly “great”. Who, being given the chance, is not going to vote Tibet as one of the best motorcycling destinations on the planet? Not me. Also, Cardomom mountains in Cambodia are very interesting and enjoyable on a bike. The best adventure motorcycling I have come across so far in the USA is probably the unearthly Valley of Gods in southern Utah. 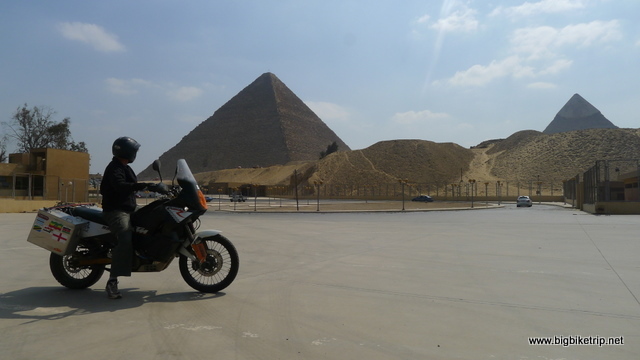 I have ridden all over the USA on various machines over the year, but there is still a lot for me to see and explore and so there may be better places, but the Valley of Gods, although quite small is a superb ride. 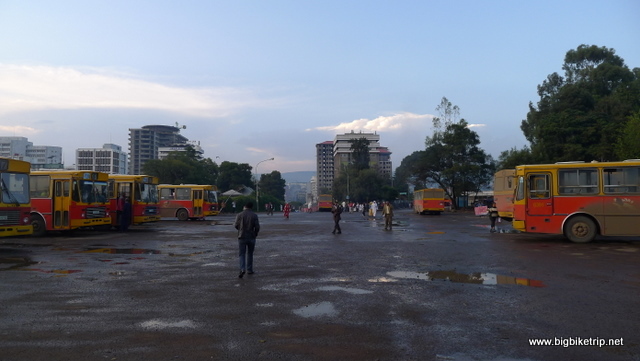 Riding through any of the African Capital cities was tiresome, annoying, stressful and decidedly dangerous… in particular Cairo, Nairobi and Addis Ababa. It was no problem technically for either of us, we come from Shanghai after all where the traffic is atrocious and ride our bicycles everyday, but the appalling driving standards, poor urban planning and ever increasing traffic volume made riding less fun than it should be. Whilst we rode on appalling roads and surfaces, such as the road from Marsabit to Moyale in north Kenya, they presented the sort of challenges bikers relish and we confronted and overcame them with a huge sense of 成就感 and enjoyment. Worst Motorcycling Experience in Europe … again the inner cities of Italy and England spring to mind…. but no where near as bad as China or Egypt. In England the speed cameras ruin motorcycling and in Italy the narrow medieval roads through the towns, and aggressive and poor driving standard by Italians make riding a bit stressful, but not too bad. In London, there are feral “non indigenous” teenagers who ride scooters, terrorize people, and steal with impunity because the police do nothing. These thugs also spray acid into people’s faces from squeezy bottles or attack people with hammers and angle grinders ….and get away with it because the ethnic majority have voted for treacherous politicians like Khan and Abbott who support these hooligans because they think the indigenous English deserve it. The police, courts and authorities are stuck between a rock and a hard place and so they are largely impotent. They stick to arresting soft targets like 1970s DJs, non contentious traffic offences and local middle class people for Orwellian “thoughtcrimes”. When I was a police officer in London in the 1980s it was urban chaos then, lots of race riots, inner city anomie, and quite dangerous. However, you did your job, your colleagues and bosses supported you, and you got promoted or advanced to more interesting jobs based on merit and ability. Now in politically correct and easily offended Britain its the opposite and so basically the police have given up and much of London is a “no go” ghetto. By comparison, when we were riding in north Kenya, borders with Somalia, east Ethiopia, central and north Sinai and the western Sahara ISIS were just starting to take hold and there was a real possibility of running into a pickup truck of crazy Islamists. 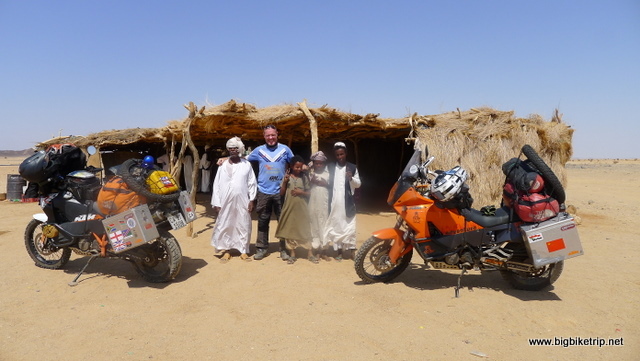 However, there were lots of armed police and army, local Bedouins were friendly and helpful, we were on fast powerful motorcycles, able and allowed to defend and look after ourselves, and so the odds were even. Our advice is don’t ride into London. Ride around it, or park outside and take public transport into the tourist areas, see the changing of the guard, the museums, art galleries, theaters, cafes and shops and then get out as quick as possible. In fact, best to avoid all English cities and head to the beautiful Cotswolds, Peak District, Devon and Cornwall, the Jurassic coast, the Fens, the Lake District, Scotland or Wales and a nice rural pub. 1. 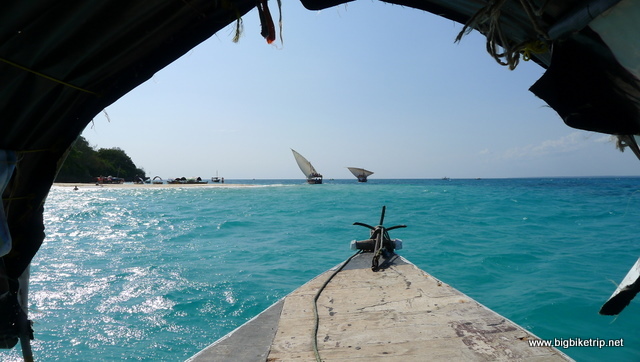 Lake Charla – Tanzania – What a gem. 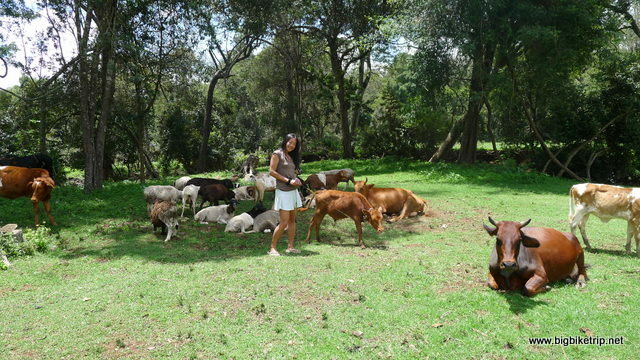 perfect climate, stunning views of Mount Kilimanjaro, hundreds of elephants, Colobus monkeys, unspoiled bush, a spectacular volcanic crater lake, great bar, friendly hosts, and of course the famous roasted goat dinner. 2. Makuzi – Malawi. 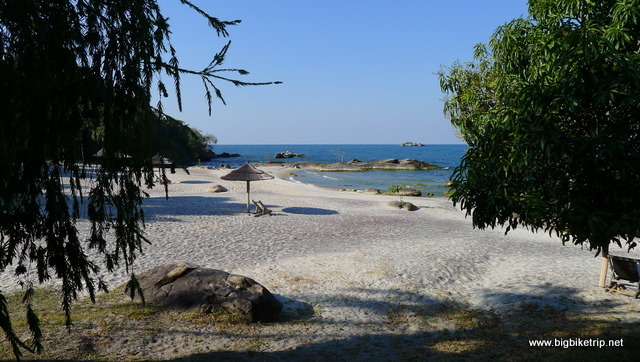 Peaceful paradise on the shores of Lake Malawi. 3. Mountain Rock – Kenya. 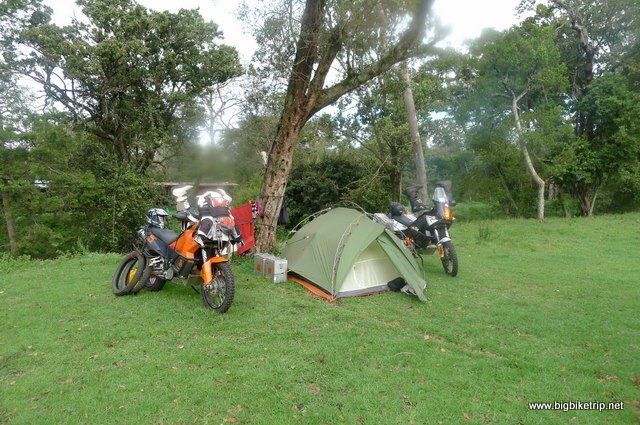 A lush enjoyable grassy campsite next to a trout filled river on the equator in the foothills of Mount Kenya. Europe ….Scotland no camp sites in the whole of Europe were on the same scale of the three above in Africa. Camping in Europe, regardless of whether its next to stunning scenery like Mont Blanc or near a historical town like Lucca in Italy has a whiff of concentration camp about it. France has simple and clean municipal campsites that were great value. Italy had some decent places but they were expensive. Wales was quite good. England just doesn’t have any and the few there are are awful, with a few exceptions. Our worst experience on the whole expedition was at Crystal Palace in London where we were interrogated and abused by gestapo like camp wardens. Hobson’s choice because London is so expensive, in fact the most expensive anywhere, and so camping was the only alternative to paying over 100 pounds for a small room for a night. Scotland however has no trespass laws and so provided you show respect for the owners property and leave the site in the condition you found it in you can free camp where you like. Its also a gloriously pretty and interesting country and so the best European camping award easily goes to Scotland, followed by France and Wales. North west point of Scotland at 11pm in the evening. China – Nan Tso (Tibet). China is a great country to back pack across (I have done it) and as such has great youth hostels and cheap accommodation in all cities and towns. As for camping, China is, on the whole, a safe country (apart from driving standards). However, despite its enormous size there is not a great deal of spare land that is not farmed on or developed… until you get into the remote western provinces of Xizang (Tibet), Xinjiang and Qinghai. We were very fortunate to camp in two stunning locations. One with Lamas on the banks of a river in the Himalayas and another in the middle of Tibet at over 5000 meters next to the shores of Tibet’s most sacred lake, Nam Tso with 7,000 meter + peaks surrounding us. 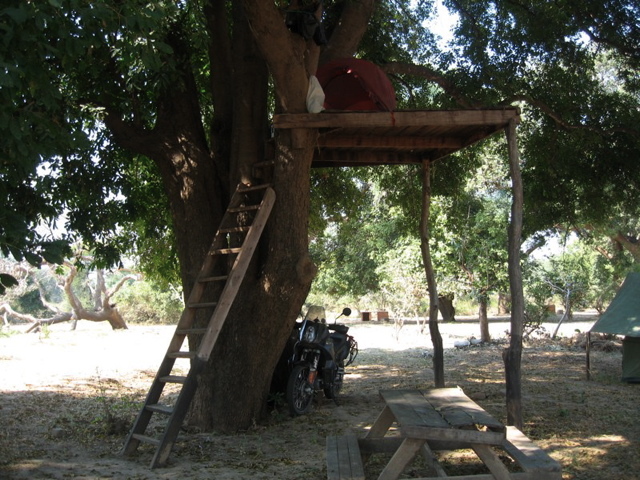 Campsites in the USA are basic by African and European standards. They are clean, tidy, averagely cheap, have friendly elderly attendants, but usually lack ablutions and the facilities you get in continental European campsites and most African lodges. Apart from free camping, which I did a lot and prefer, the best organised campsite I found was at Needles in Utah, just south of Moab. In other States the campsites are pretty gruesome, far too expensive and generally geared towards caravans and RVs, and so free camping with a tent is the best option, and easy to do. We never stayed at any really bad campsites. To our mind the simpler the better and there should be more like the good ones we saw in Africa. Whilst Sudan allows free camping, Egypt is heavily controlled by the military and police and our attempts to free camp were fruitless. We were chased off seemingly remote places in the desert and along the Red Sea by police, army and security people. Being unable to camp in certain places, we did stay in some rather ropey (because they were cheap) hotels in Sudan and Ethiopia but you get what you pay for and we didn’t pay very much. 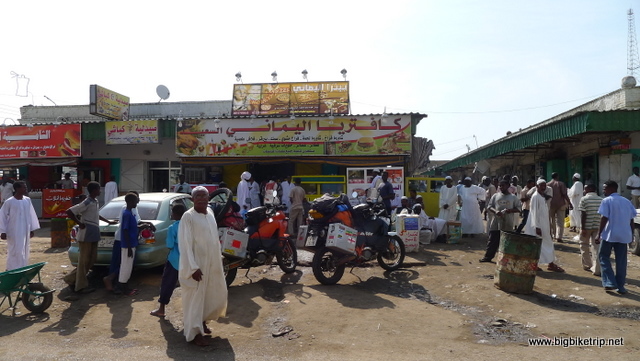 The Kilpatra hotel in Wadi Halfa had the worst lavatory and shower outside China… a true shocker. Of course, Europe is the land of the caravan. Rarely seen in Africa or Asia, these boxes on wheels are seen everywhere in western Europe, blocking the country lanes and oblivious or uncaring to the traffic mayhem they cause around them. To a biker they are annoying enough, but we can whizz pass them more often than not. To another car driver stuck behind one on a road in Cornwall I hate to think. No wonder they are targets of Top Gear persecution and derision. Once they eventually get to their “beauty spot” they position themselves cheek by jowl and then the occupants immediately position themselves outside on deckchairs, guarding their plot with disapproving territorial expressions on their faces. Actually, these caravan clubers are not a bad bunch when you get to know them and are often passionate about their caravaning lifestyles and can wax lyrical about chemical toilets and lace curtains. I have to say caravaners, with their impressive tea making facilities and well stocked biscuit tins, who brew up on the hour every hour are always welcome next to our tent. Apart from the Chinese food we had in various places, Egypt probably just surpasses South Africa as the country with the best food in Africa. 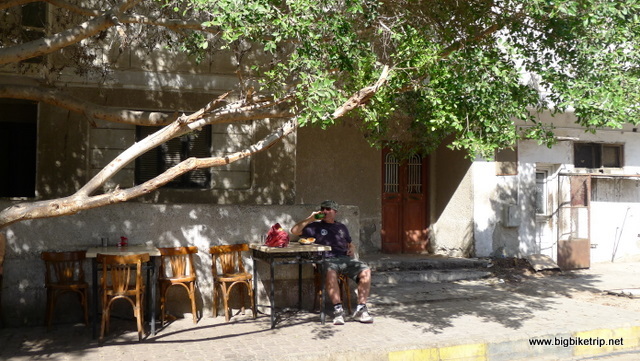 Fresh seafood, spicy curries, kebabs and falafel, roti, dates, fruit, salads, tasty bread… and good beer. 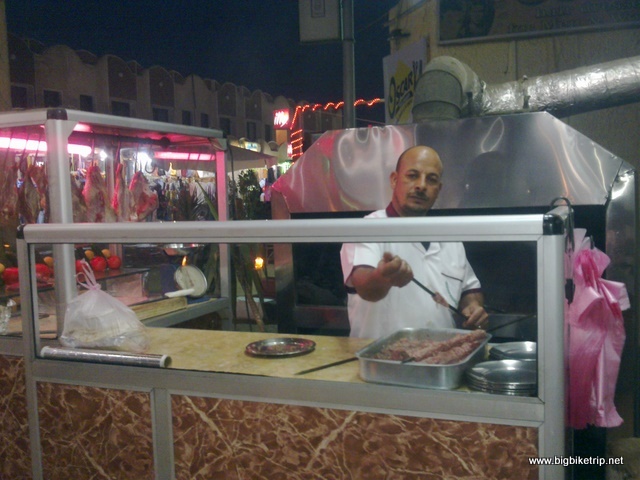 The food in Sudan is also pretty good and the Nile fish breakfast in Wadi Halfa is a special treat, especially with Bedouin coffee or tea. Again icy fruit juices are a specialty and very welcome when the temperature is scorching hot. 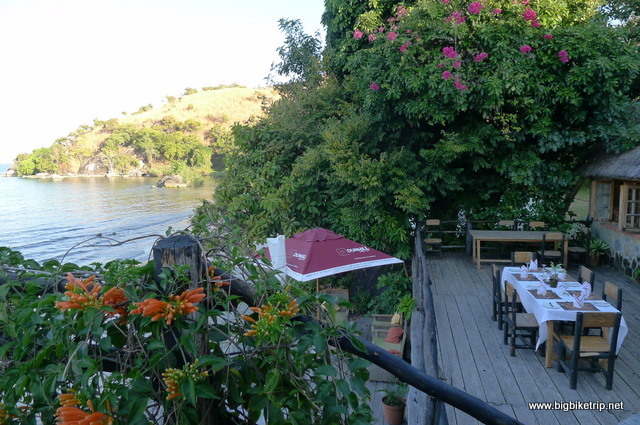 The best food we ate in Europe was in Turkey. This was a big surprise as we don’t think either of us have been to a Turkish restaurant in our lives. Whilst in Istanbul and Mersin we were treated to some excellent local feasts by our new Turkish friends. 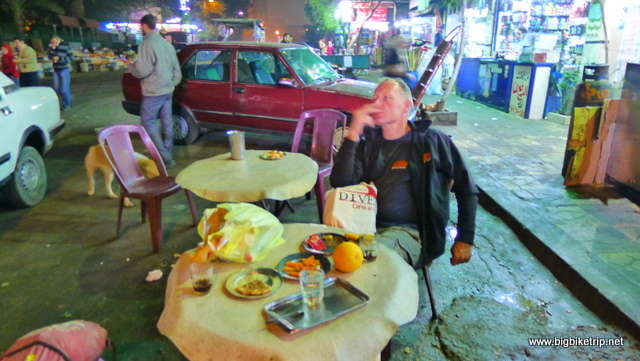 The street food was also cheap and delicious, a bit like in Egypt. Further along through Europe we had delicious cakes and pastries, especially in Austria, Italy and France, but the classic Italian and French fine cuisine famous throughout the World was not available to us because of the cost. I am sure its delicious, its just we couldn’t afford any. We were fortunate to be in Italy during Easter and were treated to a delicious traditional Italian lunch with our friends Nick and Paola and her family near Rome. We also had some great home cooking with family and friends while we were in England and Wales. I know there is good food about in Britain, but can you find it when you are hungry, or afford to eat decently in, say, London? No. Ubiquitous sandwich shops, junk food, petrol station food, and processed food is the tourists’ lot. Best you can get is a good cardiac arrest “fry up” breakfast at a roadside lay-by or fish and chips for dinner. Even the so called ethnic food we had in the UK, like Indian or Thai was awful. So, unless you are lucky to be invited to eat at a “Master Chef” finalists’ house, have relatives and friends who are good cooks or win the lottery and have the chance to try out a Michelin starred restaurant you are going to be disappointed on the food front in the UK. We met many tourists, especially Chinese who were on the verge of tour group mutiny in the UK because they disliked the food so much. China – overall winner by a long way….. Nothing beats the food in China for variety, freshness, health, flavour, texture, low cost, accessibility, colour, exoticness, pure joy and of course taste. Spicy Hunan and Sichuan, sweet and sour Shanghainese, salty and savoury Dong Bei, roasted meat from Xinjiang and seafood from Guangdong …..and it goes on with each province and each region within a province having their own specialties and traditions . We all need food and everywhere we went in the world the people took pride in their local cuisine, but to our mind nothing beats Chinese food. We and 1.4 billion others think so anyway..
Best Chinese Restaurant outside China – Xiao Long (Laughing Dragon) – Livingstone, Zambia. On par with the Sichuan and Hunan food we have in China, but I suspect only if you insist on the genuine stuff… in Mandarin ….and have a Chinese companion who does a thorough inspection of the kitchen, the ingredients and interrogates all the staff. Worst Chinese Restaurant outside China– The Panda – Mosi, Tanzania (The lovely girl, Cheng Yuan Yuan, who was left in charge of the restaurant while the owner went back to China admitted she couldn’t cook and neither could the chef). In the end one of the Chinese guests went in the kitchen and cooked a few dishes which we shared. The lakeside resorts run by foreignors had pretty good food, but unless you like eating a diet consisting of 99% cassava (which has the nutritional value and taste of a flip flop) you will starve in the rest of the country as indeed a lot of the people are doing. There is no excuse for this as Malawi has fresh water, untapped natural resources and shares nearly the same geology and agricultural potential as Tanzania which grows coffee, tea, fruit and vegetables in abundance. The problem, as with too many places in Africa, lies with the government who are greedy, corrupt and incompetent …and the people who put up with such tyrants who keep them in the stone age. The other crop that grows pretty freely in Malawi is marijuana , so if you like you can spend your days in Malawi stoned out of your skull in a blue haze, however when you get the munchies don’t expect to see much in the fridge. Worst food in Europe – the UK. If you have the money, or live with an excellent cook you will eat as well as anywhere in the world. However for any visitor to the UK the food on the street is pretty dire. The healthy option, if so inclined, is a salad with a bit of meat or fish in a plastic box. Still hungry? .. of course you are … so a tub of lard for pudding. You can tell by the unhealty disposition and obesity of most English people that there is little nutrition in many peoples diet. In England the day starts off well with a variety of decent breakfasts and then goes downhill thereon. Worst food in China – Tibet. If we are to be picky, a diet that consists of a thousand ways to eat yak and yak’s milk might be pushing the limits… so local Tibetan food, whilst pretty OK, is at bottom of of the list as there is some amazing food to be eaten in every province across China. All this being said the upside of increasing migration of more Han Chinese into Tibet is that good food from other provinces can be found in the main cities in Tibet. Is that a good or a bad thing? Its a good thing when you’re hungry. Also, I have to mention the province of Guangxi and Chinese provinces bordering Laos and Vietnam for their fondness for dog, rat, pangolin, civet cat, and other furry, feathered and scaly creatures and their insides… nope…. not my cup of nai cha, nor Fanny’s. 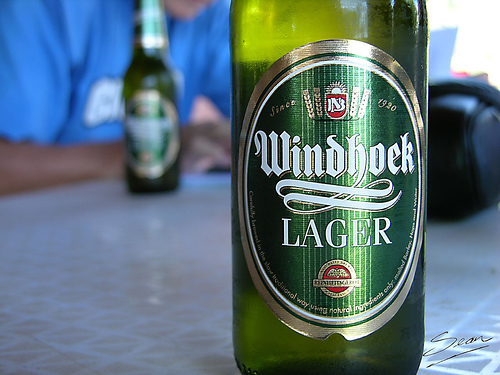 Africa – Namibia – Windhoek beer. WORST BEER AWARDS – of course there is no worst beer award, but perhaps Sudan should get a mention for not allowing beer at all. In fact the punishment for any alcohol possession in Sudan is 40 lashes. 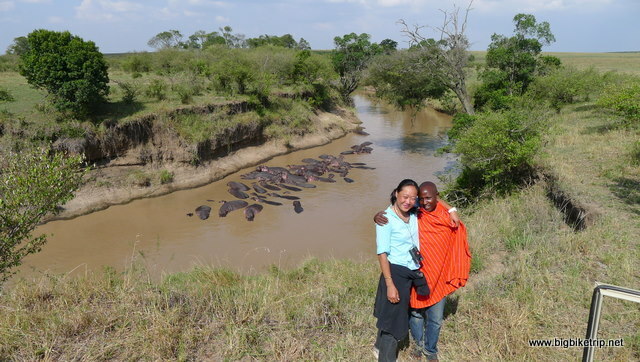 We had an awesome time in Masai Mara. 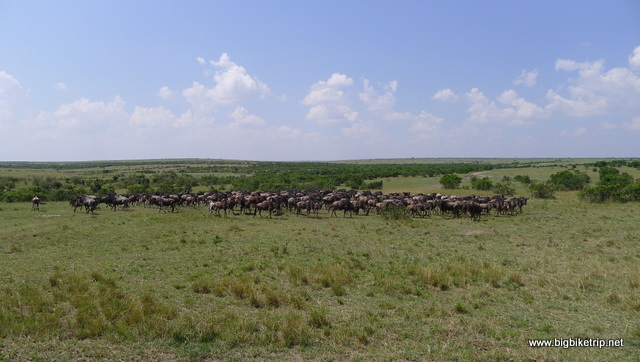 Great guides, reasonable entry fees (compared to Tanzania), and when we were there the great wildebeest migration was in residence and stretched across the grassy plains as far as the eye could see. It was true Lion King country and we had a terrific motorcycle ride to get there along cattle tracks and through Masai villages. 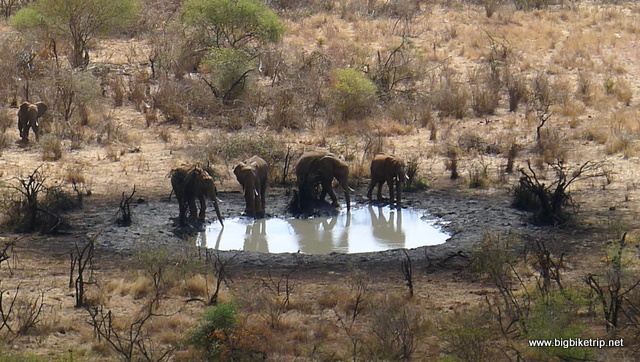 South Luangwa National Park is possibly one of the prettiest and diverse game reserves in Africa. Certainly one of my favourite. Unfortunately, while I was there the last rhino had been poached in collusion with corrupt security guards who for their evil part were paid a fraction of what the horns were eventually sold for in Asia. 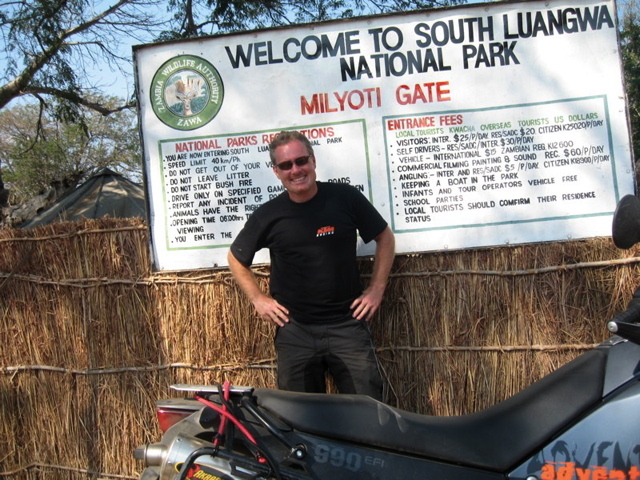 Whilst the 150 kilometer road from Chipata to the national park was too technical for Fanny at that particular stage of our expedition (not now of course), I had been there on a previous motorcycle trip across Africa and on the way bumped into the Long Way Down TV show motorcycles on their way to Lusaka. 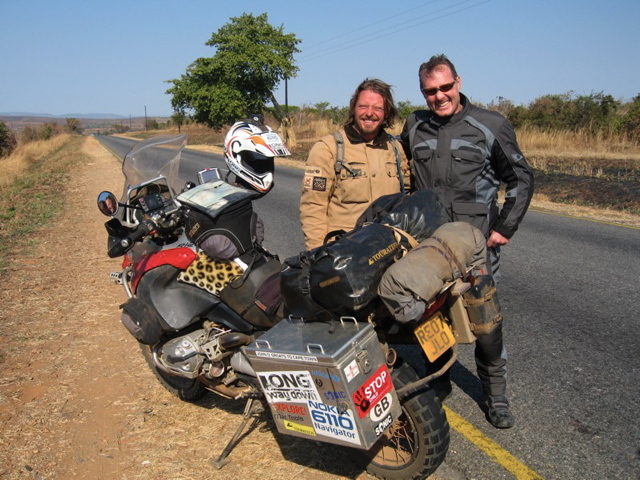 They had also decided against going to Luangwa because the road was too tough for Mr. and Mrs. McGregor, although easy for Charlie Boorman and the cameraman, Claudio I expect, who turned out to be decent guys and true motorcycle enthusiasts. 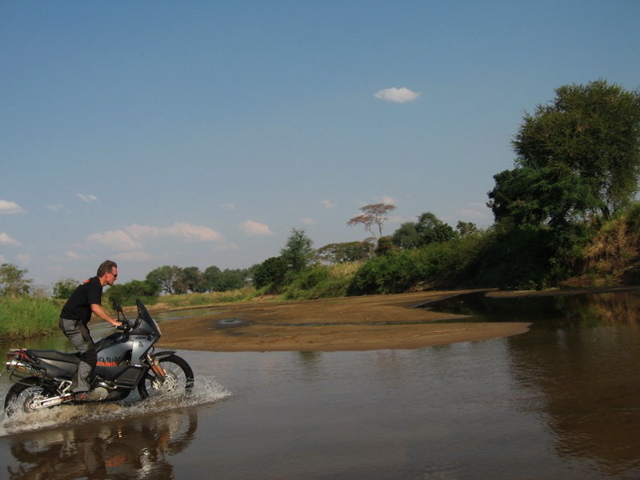 With the help of my Zambian cousin I managed to ride right into the game park along a locally used two track sand road and ride right up to many of the African animals and through the stunning bush of the Valley, but trying to keep a decent distance from creatures that might like a KTM sandwich. 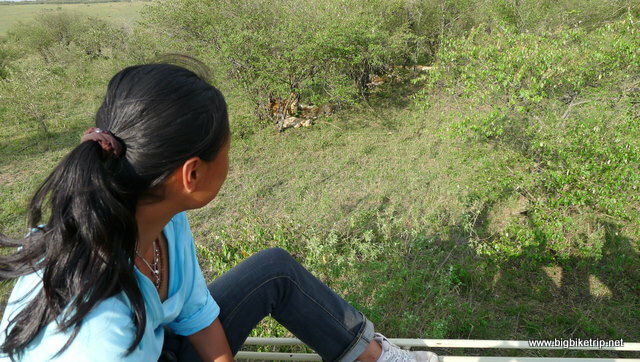 However, I inadvertently rode into a herd elephants and was mock charged by a young male which was quite exciting. They do not like the sound or sight of motorcycles at all, especially with loud Akropovik exhausts. 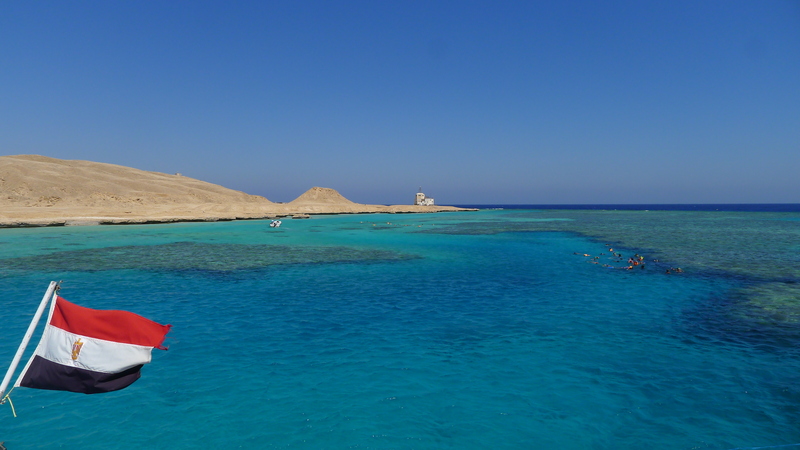 Ras Mohammed, Dahab and Sharm El Sheikh, Sinai, Egypt. 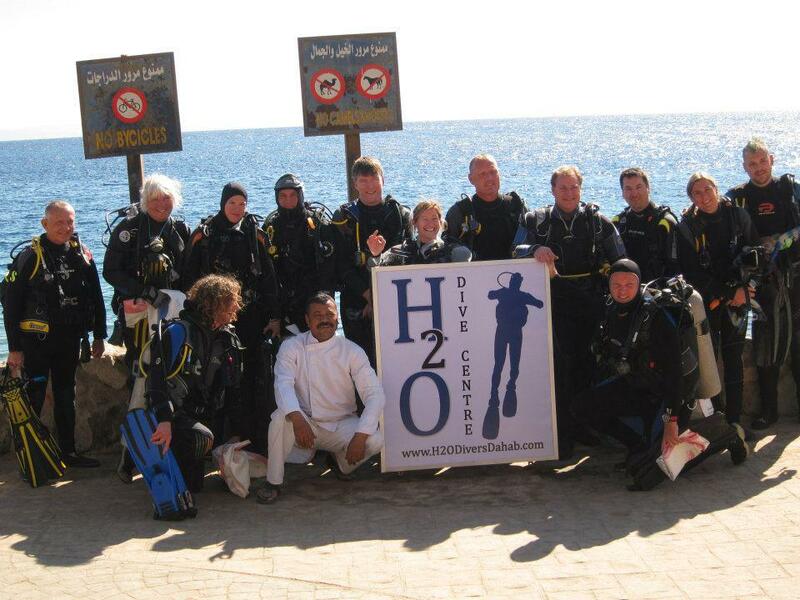 I do not care for diving particularly having been put off when I did a CT selection course when I was in the Royal Hong Kong police, but due to putting down roots in Dahab by the beautiful Red Sea I had little to do while Fanny was windsurfing and so I have now completed the PADI open water and advanced scuba course with H2O Divers. 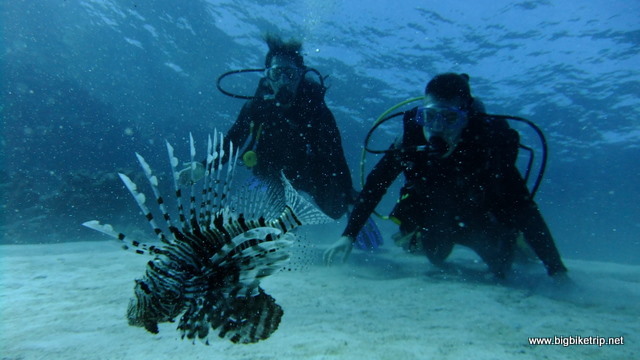 Dahab is 90 Kms away from Sharm El Sheikh in the Gulf of Aqaba (Red Sea) and enjoys amazing marine life and is a very popular destination for kite surfing, wind surfing and diving. 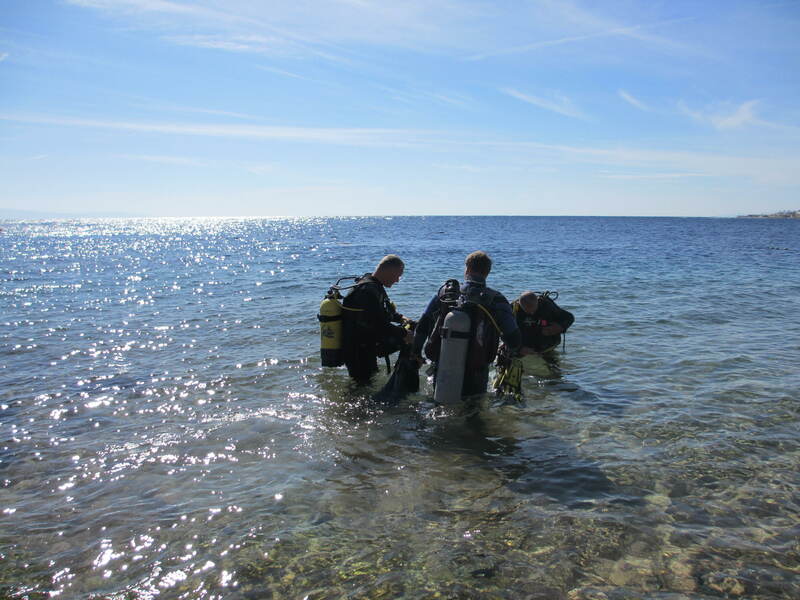 As well as scuba diving with an aqua lung, I also learnt to free dive and practised nearly everyday at the famous Blue Hole, or just off the coral reefs at Eel Garden, The Caves or Lighthouse. Amazing places. Fanny on the other hand learnt to windsurf in the lagoon with Planet Windsurf and is now a very competent sailor. 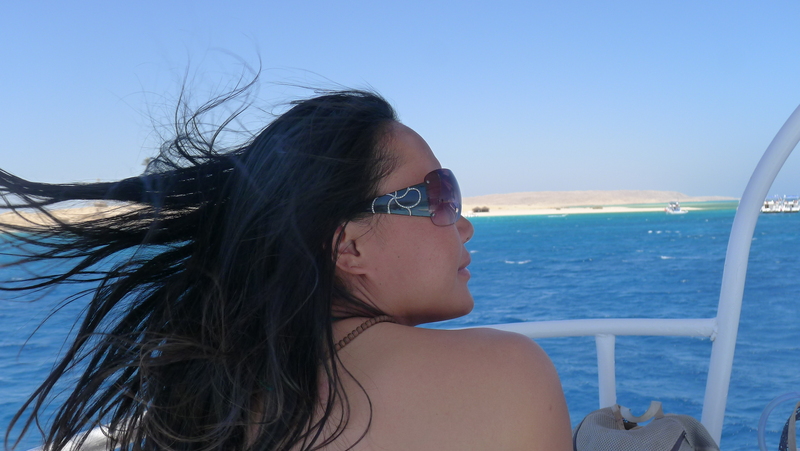 The Red Sea in Egypt, especially along the Sinai peninsular is absolutely spectacular. 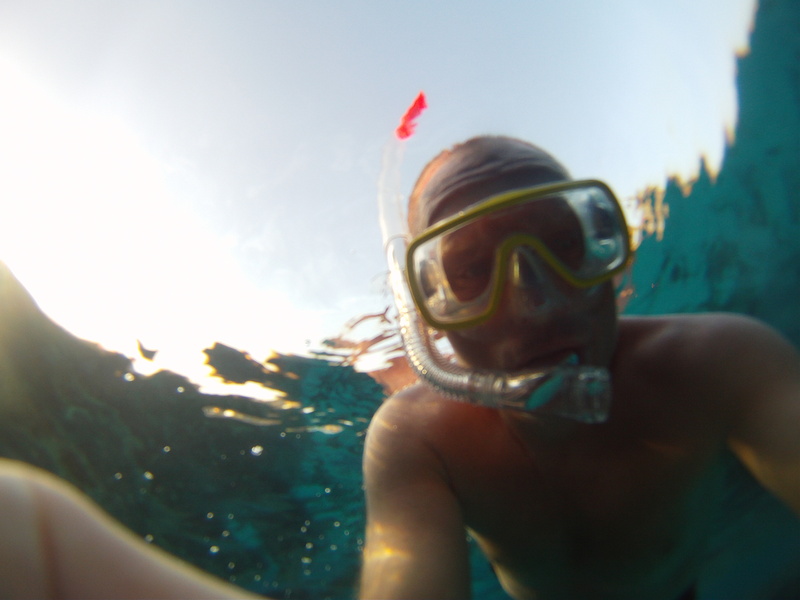 I have been fortunate to have traveled around most of South East Asia, but the Red Sea is to my mind better. 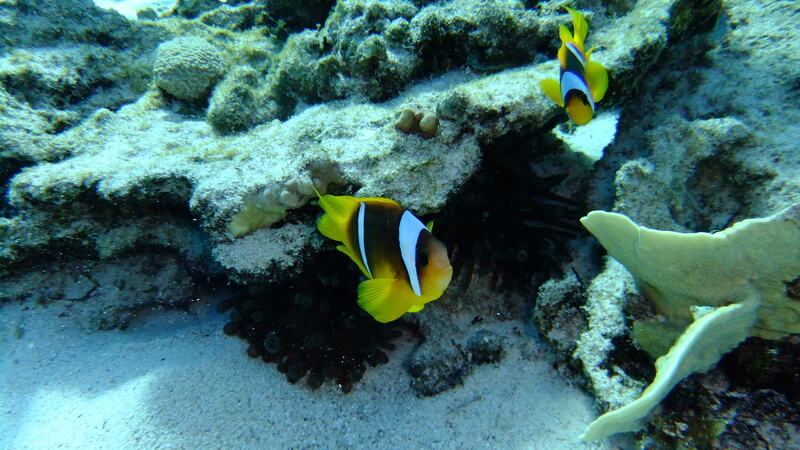 Crystal clear warm waters, amazing tropical fish and coral reefs and pretty decent infrastructure to support it all. The Sinai desert mountains create an awesome backdrop to the coastal towns of Nuweiba, Taba and especially Dahab, and the desert itself is quite possibly the prettiest in the world, especially at sunset and sunrise. That said, the whole tourism thing could be done so so much better, but then the Egyptian tourist industry is reeling from the Arab Spring revolution, the world economic downturn and the negative effects of blowing up tourists with fire-bombs. Any open water in East or South China. Polluted and disgusting. 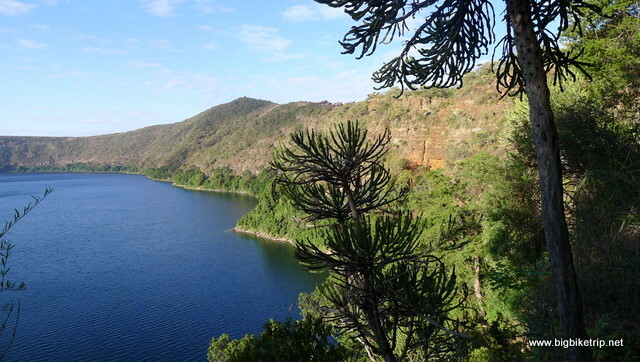 Whilst we thought Ethiopia was spoiled a bit by some of its annoying stone throwing feral inhabitants and decaying cities, it does have spectacular natural beauty with mountains, rivers, pastures, lakes and valleys that looks a bit like those in Switzerland, Scotland or Austria. The roads are also for the large part extremely good, although as I have said often crowded with people and animals. Lesotho, which is bordered completely by South Africa, is also a very mountainous country and is an excellent place to visit, albeit a bit chilly to ride through in winter. Ethiopia’s proximity to some very dodgy African countries, short visa restrictions and some very wet weather while we were there prevented us from exploring the amazing Danakil depression and Afar region in the east of the country which are said to be spectacular. 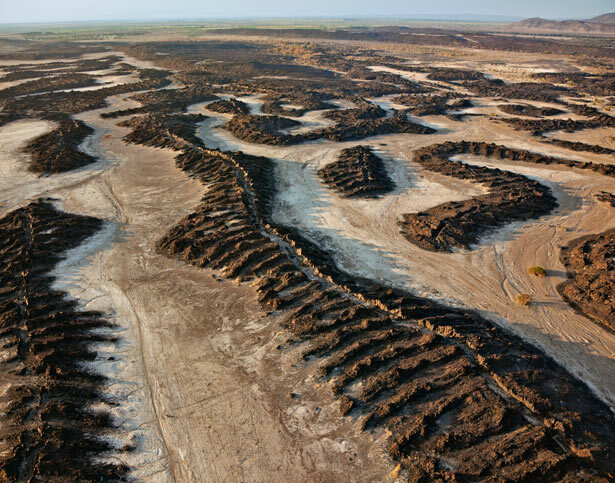 Not many regrets on the expedition, but not venturing to this amazing part of the world that features in the January 2012 edition of National Geographic magazine. 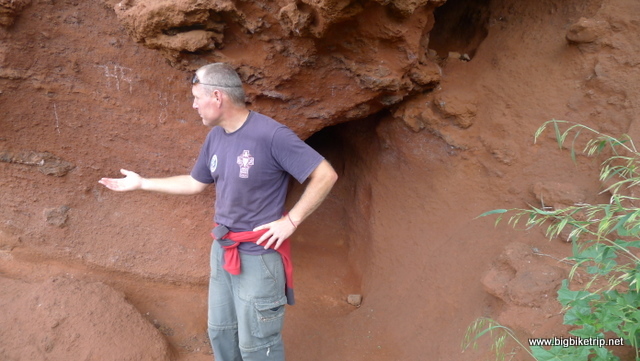 We did go to Lalibela to see the rock hewn churches, and they were fairly interesting. But unless you are an archaeologist or Christian pilgrim you’d be better off visiting Salisbury Cathedral, and indeed any Norman church in England as they are older, far more impressive and have less fleas. The ride there was fun though and took us “off road” for a few hundred kilometers through valleys and across rivers and streams. Europe – you are probably going the expect me to say The Alps, Pyrenees or the Dolomites, maybe the Brecon Beacons or Snowdonia in Wales and indeed they are spectacular, but I am going to have to pick the mountains and valleys I enjoyed riding through the most and so I will say The Highlands of Scotland. China – is a very mountainous part of the world and along our 13,000 kilometer ride through the middle kingdom we navigated over, around and often through many mountain ranges. Chinese history is steeped in legend about mountains and have been the subject of pilgrimages by emperors and philosophers throughout the ages. We were lucky to see some of the wuyue 五岳 – sacred five and the Buddhist and Taoist fours. But for me and Fanny seeing (and riding through) the greatest mountain range on the planet with the highest peaks, the Himalayas was one of the highlights of the expedition. The Himalayas… what can you say? Africa – South Africa. Quite simply modern, efficient, quick and fair. China – no border crossings.. although riding through the road blocks in Tibet was “interesting”. 1st Egypt and 2nd Sudan. The opposite of modern, efficient, quick, or fair. 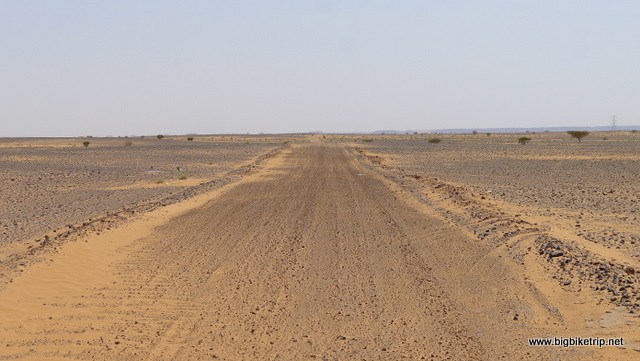 The further north in Africa we went the worse the border crossings became. Most countries we went through in Africa could very fairly be described as corrupt. Some more than others. Unfortunately, there are countries we simply couldn’t risk traveling through because they are so corrupt and dangerous, such as the DRC, Chad, Nigeria etc.. Even the famous Dakar Rally no longer races through the Sahara to Dakar and has moved to Argentina and Chile in South America. Policeman ‘Haha.. OK you go’ and so we went. On each occasion the authorities even suggested a bribe I stood my ground or played my “I used to be a policeman” trump card and they all gave up. 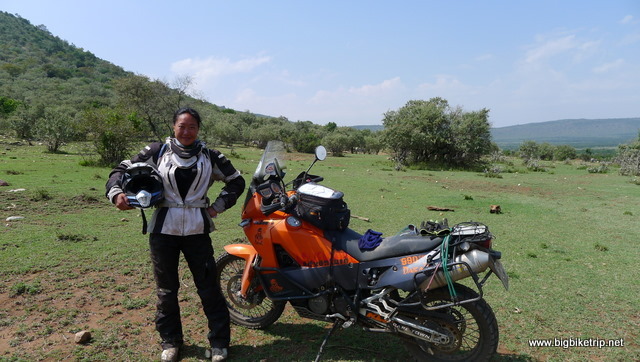 Some of Fanny’s friends, a Chinese expedition starting from South Africa and riding Jin Chiang motorcycle and side-cars, gave up in Tanzania after running out of money, spirit and heart after paying bribe after bribe and being messed about at every single border crossing. I guess the Africans thought that Chinese are accustomed to paying bribes. Maybe they are, and maybe they are also as fed up as everyone else. NOISIEST COUNTRY AWARDS – Sudan followed by China and Egypt. Sudan is a strictly Islamic country and so requires its Muslim population to pray five times a day among other noisy rituals. The density of mosques and minarets in Sudan is very high and the call to prayers starts at 4-5 am which is rather early and without doubt a very loud wake -up alarm call where ever you are. I vaguely remember bell ringing on Sunday mornings from the church in the village, Abbots Bromley, I grew up in England, and even that annoyed me after a few peels. As a Roaming Catholic of the lapsed kind I am a firm believer that anyone can believe in what they like provided it causes no harm to others, but object to people inflicting their superstitions, religion and beliefs on other people. My helpful suggestion that calls to prayer be made using mobile phones on vibrate mode was not met enthusiastically by anyone I met, nor was the suggestion that “All Things Bright and Beautiful” might be more cheerful. There are 1.4 billion Chinese, the streets are crowded, and they absolutely love noise and any excuse to make some is welcomed and encouraged. 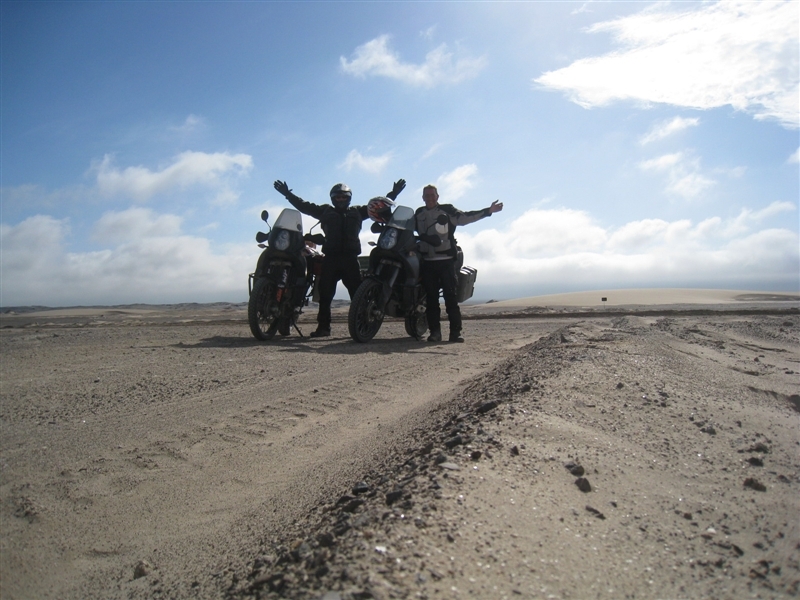 To the motorcyclists who like a bit of technical off road riding, stunning scenery, quiet roads, good camping sites, African animals and birds, decent petrol and getting close to unspoiled nature then Namibia is the country to go and disturb the peace with your Akropovik or Leo Vince exhausts! This entry was posted in Africa, Africa Twin, Animals, Asia, BDR, bears, Bikes, Cambodia, China, crf1000l, Elephant, England, Equipment, Europe, Fanny, Hiking, Honda Africa Twin, Kinder Plateau, KTM, Lion, Mechanics, New Balance, offas dyke, People, Places, real ale, Rhino, Route, Rupert, Sheep, Tibet, tigers, Uncategorized, USA, Wales, Yak. Tagged adventure, Africa, Africa Twin, Best, bike theft, camping, Ethiopia, Fanny, food, Honda, Kenya, KTM, motorcycle, Rupert, sig sauer, South Africa, Sudan, Tanzania, Trump, USA, Worst, Yamaha. Next time you are in Chongqing or Melboune Australia I’d be up for a ride and a beer!